OCCC students, faculty and staff lobbied at the State Capitol Tuesday to encourage legislators to support higher education. On the same day, the State Equalization Board certified that those legislators will have $1.3 billion less to spend next fiscal year. “We know that there are cuts coming but the point is let’s see what we can do to create the best case scenario for Oklahoma City Community College and higher ed,” said Acting Executive Vice President Stephen Bloomberg. The budget cuts are one of the most important issues facing higher education, said broadcast journalism major Aaron Cardenas. Cardenas said the cuts were the reason he took the time to go to the capitol Tuesday. “I want to know exactly what they are doing with the money,” the first generation college student said. At a program dedicated to higher education in the House of Representatives chambers, Governor Mary Fallin stressed that cuts happen because the state must balance their budget. “We can’t just print money like the federal government does and we can’t just overspend like the federal government does,” she said. Fallin also stressed the importance of higher education. Fallin said that 75 percent of Oklahoma and national jobs will require more than a high school education. “The best thing you can do to secure a successful future is to complete your education,” she said. Professor Gorma said he would be calling on legislators to remember their own education on the lobby day. “Many of these very same people who work here at the Legislature are higher educated themselves. They too can understand that most of them would not be here without higher education,” he said. Some students said that they had come to the capitol to voice their personal concerns about what these budget cuts are doing to their school. “I know that with the cuts we are going to be losing a lot of professors and certain classes are going to be taken out,” Cardenas said. Last Fall, Cardenas was a student in Professor Stephen Morrow’s popular Advocates of Peace class when it was cancelled. He and other students petitioned for it to be reinstated. Acting Academic Affairs Vice President Ann DeClouette later said that funding and increased enrollment are factors in why Advocates of Peace, and other courses, were removed from the schedule. The college budget does not allow additional faculty to be hired in the English and Humanities Division. A 6.5 percent cut to statewide higher ed for this fiscal year translated to nearly $1 million less for OCCC. Then, in January of this year, the statewide shortfall caused an additional reduction in the college’s state funding by $503,825. “You see that there’s classes that are being taken out of the schools and you see that there are teachers with jobs and they’re already not getting paid enough,” Cardenas said. He said as a college student he is now more aware of how poorly the state is funding higher education. 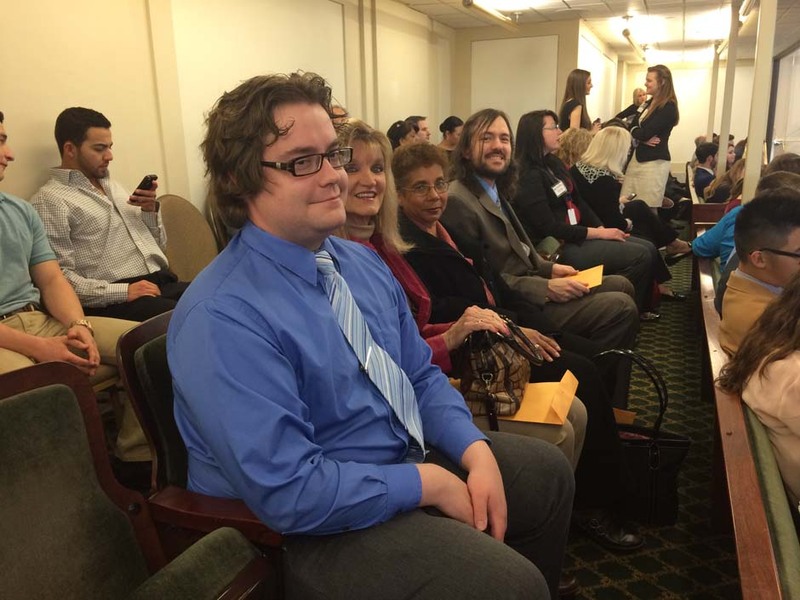 Over 80 OCCC students, faculty and staff attended the lobbying day. Political Science Professor Nate Vanden Brook said that his senator, Ralph Shortey, has introduced several bills in the recent years that would allow guns on campus— something Vanden Brook and the state Board of Regents oppose. He said he is not sure lobbying will change the senator’s mind, but he thinks that attempting to in numbers may. “I’m still of the belief that putting a personal face, putting a name, a story, giving them a narrative is beneficial to citizen lobbying and so because of that I think it’s worthwhile to at least attempt to have a conversation with people,” Vanden Brook said.